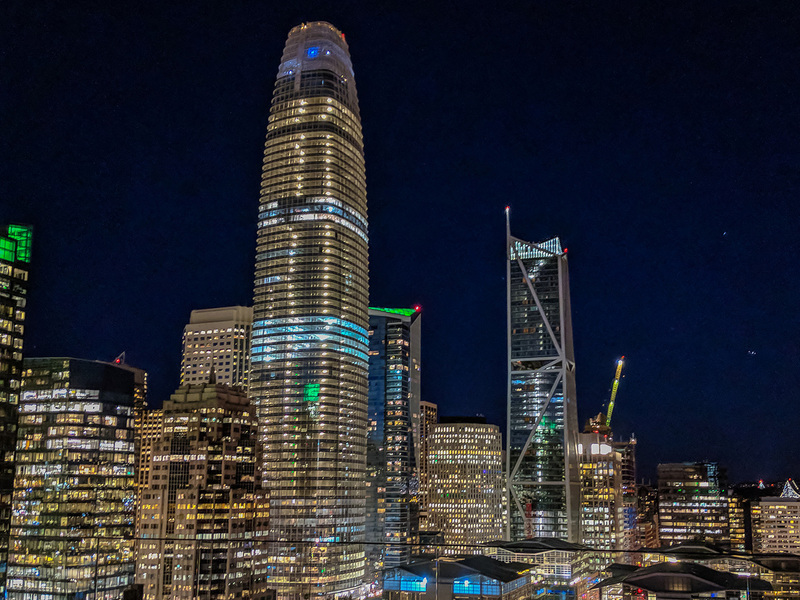 Bay Nature: Will the Salesforce Tower's Lights Affect Migrating Birds? Will the Salesforce Tower’s Light-Up Top Affect Birds? Thank you for this great question Chris. It’s one that we have spent much time considering, and we don’t yet have an answer. Two things we do know: artificial night lighting can confuse and disorient birds and San Francisco is a place of major importance for myriad migratory bird species. San Francisco is along the Pacific Flyway where each year over 200 species of birds migrate north to their breeding grounds and then south to their wintering grounds. Most bird species (whether songbirds, waterfowl or shorebirds) migrate at night, taking advantage of favorable weather conditions and avoiding diurnal predators like hawks. Nocturnal migrants rely on the moon and stars as navigational guides, and tend to rest and feed or refuel themselves for their continuing migration during the day. People have known for years that birds fly into reflective glass despite their incredible vision, and numerous events have been documented where dead birds, sometimes in the hundreds, were found at the bases of lighthouses and buildings. Scientists researching the causes have concluded that birds do not perceive glass as a solid object to be avoided. And countless birds have been drawn off course by artificial light. Studies have been conducted at reflective glass buildings, at East Coast lighthouses (outward beams of light), Gulf Coast oil rig platforms (steady red or white light), and 10 years of the Tribute in Light at the National September 11 Memorial Museum in New York City (upward beams of light). In May 2017, 395 migratory birds died after crashing into the artificially lit National Insurance skyscraper in Galveston, Texas in a nighttime rain storm. San Francisco’s Downtown Plan calls for building developers to dedicate 1 percent of a new building’s budget to a public art project. The Salesforce Tower’s developer and landlord Boston Properties selected a tower-top installation by artist Jim Campbell. GGAS reviewed the proposal, met with the city, developer and artist in June 2017, and toured the installation in progress in January 2018. All parties expressed concern for birds. Campbell’s installation, called “Day for Night,” opened on May 22 and covers the top six floors of the tower. Lights on the building project videos – waves, clouds and dancers – onto a metal skin frame. The lights are moving, not solid; face inward, not outward or up into the sky, so people and birds will see this as reflected or indirect light. Depending on weather conditions, though, the lighting can be seen from as far away as 20 miles. GGAS requests that all city buildings observe Audubon’s “Lights Out for Birds” campaign during the spring (February 15-May 31) and fall (August 15-November 30). “Lights Out for Birds” spares natural resources that fuel our electricity, saves money, and protects the lives of innumerable birds by getting humans to turn off all unnecessary lighting from dusk until dawn. GGAS also worked with the American Bird Conservancy and the city’s planning department so that in 2011 San Francisco became the first city in the United States to pass an ordinance; the Standards for Bird-Safe Buildings. To help see whether there will be impact to birds from this building light installation, Golden Gate Audubon seeks volunteers to monitor downtown buildings this fall and spring, including at the Salesforce Tower. Contact volunteer@goldengateaudubon.org for more information. Correction: This article was updated on July 11 to correct the name of the museum that is home to the September 11 Tribute in Light. Noreen Weeden is the volunteer programs director at Golden Gate Audubon Society. Ask the Naturalist is a reader-funded bimonthly column with the California Center for Natural History that answers your questions about the natural world of the San Francisco Bay Area. Have a question for the naturalist? Fill out our question form or email us at atn at baynature.org! Ask the Naturalist: What Do Hummingbirds Taste? Ask The Naturalist: How Important Are Red Toyon Berries To the Winter Food Chain?